GLAMOUR ROSES – Fresh Cut Roses, over 50 Varieties from Ecuador. Glamour Roses’ main interest is to be able to provide you with the best product for your needs. We are certain that with over 17 years in the industry. We can offer you the experience that makes us not only your rose provider, but your loyal supplier. Glamour Roses is a 15-hectare farm located 2,800 meters above sea level on the outskirts of a small town called Machachi. This is in the southern Quito-Ecuador area. 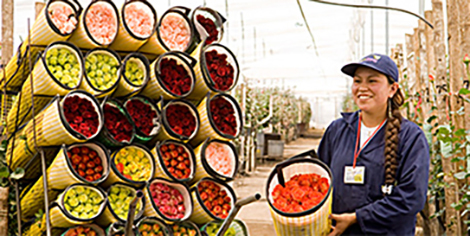 This prime geographic location is key to the development and production of high-end roses. It gives our flowers long, thick stems, with big and colorful heads. These qualities and our hard work have earned us several prestigious recognitions. Including the “High Quality Gold Medal in Moscow 2009”. This has also enabled us at Glamour Roses to excel in the most demanding, high-quality markets around the world. Namely, the Russian, European and North American markets. Since 1995 when Glamour Roses was established, our mission has been to provide the most beautiful Ecuadorian roses. Apart from offering job opportunities to over 180 employees, we also provide health programs and meals. For this, we have been certified with the “Flor Del Ecuador” label. We are also proud to say we are currently members of the “Specialty Cut Flower Grower Association” and sponsors of “Flowers For Kids”. As part of our social responsibility, we take the ecosystem and the fight against crime very seriously. Because of our efforts in these areas, we have also been certified with BASC and the Rainforest Alliance. We constantly work on improving and taking on new challenges. It is important that both the environment and the local communities stay healthy as we all grow together. For us, a key factor to our success is customer service. We offer you a personal, first-hand, and friendly experience. You can count on us providing you with tailored assistance. Because, we consider our customers both friends and business partners. We provide 24-hour a day service when required. And our professional account managers will help you with everythind, you need. We also offer a full service that includes holiday programming, tailor-made packing. As well as logistic and transportation solutions from Quito or Miami. To accommodate your needs, we work with the most professional and reliable airlines, cargo agencies and transportation services. We invite you to become our valued client and to visit our website, to learn more about us. You will see that we are more than just an excellent provider of beautiful flowers. So, give us an opportunity to serve you right! GLAMOUR ROSES – Fresh Cut Roses, over 50 Varieties.